It’s often repeated but true: Exercise keeps you healthy. It boosts your immune system, keeps the mind sharp, helps you sleep, maintains your muscle tone, and extends your healthy lifespan. Researchers have long suspected that the benefits of exercise extend down to the cellular level, but know relatively little about which exercises help cells rebuild key organelles that deteriorate with aging. 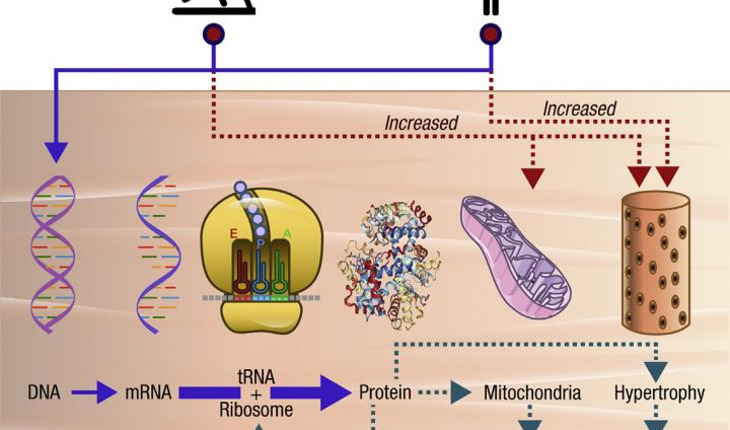 A study published March 7th 2017 in Cell Metabolism found that exercise –and in particular high-intensity interval training in aerobic exercises such as biking and walking — caused cells to make more proteins for their energy-producing mitochondria and their protein-building ribosomes, effectively stopping aging at the cellular level. The release explains that the study enrolled 36 men and 36 women from two age groups–“young” volunteers who were 18-30 years old and “older” volunteers who were 65-80 years old–into three different exercise programs: one where the volunteers did high-intensity interval biking, one where the volunteers did strength training with weights, and one that combined strength training and interval training. Then the researchers, led by then-post-doc, now Oregon State University faculty member Matthew Robinson and colleagues, took biopsies from the volunteers’ thigh muscles and compared the molecular makeup of their muscle cells to samples from sedentary volunteers. The researchers also assessed the volunteers’ amount of lean muscle mass and insulin sensitivity.